On his 50th birthday, Shahrukh Khan, so called superstar (because as per earning of the films, real superstar is Salman Khan) gave a series of interviews to 'secular' journalists Rajdeep Sardesai and Barkha Dutt. He told that yes, intolerance is increasing in country. And people started reacting against and favour of him. 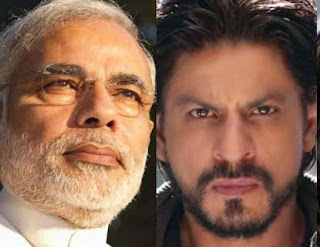 So, why Shahrukh suddenly jumped in bandwagon of intolerant movement? There are three reasons. Lets take one by one. Shahrukh Khan is said to be very insecure person. Nowadays Salman Khan, Akshay Kumar and Ajay Devgan have gone far ahead in terms of earning and giving hit films. So at this point Shahrukh's reputation is at stake. He is in pressure to give hit film to continue in race of superstar. His immediately next film will be Dilwale. It will be released on 18th December 2015. It will have to face tough competition with Sanjay Leela Bhansali's Bajirao Mastani. Shahrukh and Sanjay's -not so good relations- are well known in film industry. At time of Shahrukh's Om Shanti Om release, Bhansali's Saavaria also released. Bhansali's film didn't perform well on box office. But since then, Bhansali has got stronger. His film has new and -lucky for success-pair of stars i.e. Ranvir Singh, Deepika Padukone and Priyanka Chopra. In this case, Shahrukh had to do a publicity stunt because his film has he himeself and Kajol in lead role which would be not liked so much in comparison to new age hRanvir and Deepika. Shahrukh Khan's showing insecure was evident in past many times. When Akshay Kumar was giving successive hit films with director Priyadarshan, Shahrukh Khan snatched him on his side and produced a film called Billu Barber. But Saloon and beauty parlour associations protested against title and 'Barber' word had to be removed from title. After then Shahrukh Khan didn't like hit pair of actor Ajay Devgan and director Rohit Shetty. So he brought Shetty on his side and produced film 'Chennai Express'. Upcoming film Dilwale is also directed by Shetty. 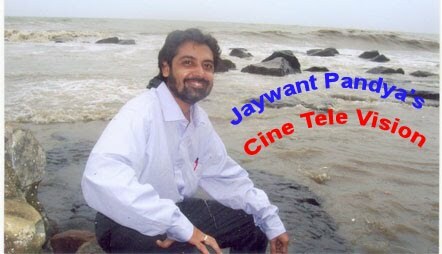 Shahrukh's film Jab Tak Hai Jaan directed by late Yash Chopda was to be released on Diwali 2012 with Ajay Devgan home production's Son Of Sardaar. At that time Ajay Devgan complained to Competition Appellat Tribunal for not getting enough single screen theatres. Shahrukh Khan apparently always tries to make Ajay jealous by showing physical proximity with his actor wife Kajol. It is well known fact that Enforcement Directorate (ED) has once again summoned on 28th October 2015 actor Shah Rukh Khan, the owner of the Kolkata Knight Riders franchise, in connection with the ongoing investigations into irregularities in the Indian Premier League (IPL). Khan had been summoned in last May too, but he had sought time to appear before the investigating agency. Neither Khan nor any KKR official could be reached for comment. The actor was at that time out of town shooting for Rohit Shetty’s movie, Dilwale. The ED is investigating two separate sales of shares by the KKR in 2009 and 2010 to Sea Island Investment Ltd, a Mauritius-based company. The agency has alleged that the shares were undervalued. The allegations are based on a report submitted by chartered accountancy firm, Chokshi & Chokshi LLP. As per Indian Express report, according sources, Chokshi & Chokshi was appointed to audit the value of the equity shares of certain IPL franchises to arrive at the correct valuation of the sales of shares. A major contention of some of the IPL franchises is that sale of shares in the early days of the IPL was at a time when there was little in terms of valuations, with controversy surrounding the league. So obviously Shahrukh had not liked this legal procedure which was not in place in UPA government to which Shahrukh Khan believed to have warm relations. It is well known fact that Shahrukh Khan is very close to Sonia Gandhi family. 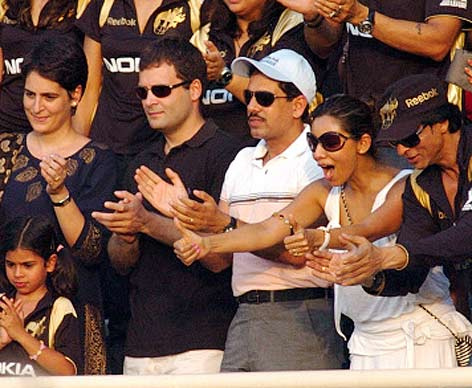 It was publicly evident from the visuals/images/pictures of Shahrukh Khan-Gauri enjoying IPL cricket match with Rahul Gandhi, Priyanka Gandhi and her husband Robert Vadra. So Shahrukh Khan has jumped in present ongoing movement of trying to create image of Bharat (India) as intolerant under Narendra Modi's government, on apparently behest of Congress and Sonia Gandhi. 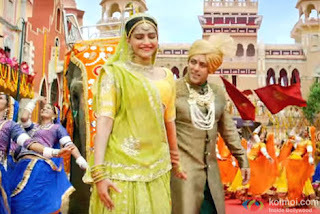 Prem Ratan Dhan Payo film by Sooraj Badjatya will be releasing on this Diwali. I could not resist my self from writing on its music album which is melodious and it is full of surprises. First of all, in present age when most of films have only three or four songs, it has, like all previous films of Sooraj, 10 sons! Second surprise is that it has not Raam-Laxman as music director who has given three musical hit films with Sooraj. Sooraj had tried Anu Malik in Main Prem Ki Deewani Hun but film music was not up to mark. It was more like Anu Malik type of music then Sooraj type of music. Then Sooraj returned to Ravindra Jain who had long association with Rajashree banner. Sooraj and Jain gave good musical album of Vivah. Now Sooraj has brought in Himesh Reshmiya which seems because of Salman Khan. Salman Khan is god father of Reshmiya as well as Sajid-Wajid. Another surprise is Palak Muchhal. Palak Muchal voice in Prem Ratan Dhan Payo is so similar to Shreya Ghoshal. Vineet Singh who participated in Saregamapa is so sweet giving rememberance of Mohd Rafi (ofcourse he can not match his level) or Sonu Nigam. Very surprising fact is Himesh Reshmmiya who doesnt sing in his high pitch and nosal voice for this film. His song's lyrics will be remembered for ever because it is about childhood. Song is well written. Shaan song aaj unse milna hai will give first remembarance of Kishore Kumar's song Aaj unse mulakat hogi but it is quite. Jab tum chaho song is wife or girlfriend special. All wives would like it. Overall, this music album is full of surprises. Great Loss To Music! Music Director And Lyricist Ravindra Jain no more! Sad news! Ravindra Jain passed away! He was not just music director but lyricist also. He was blind from vision, but had great inner sight. 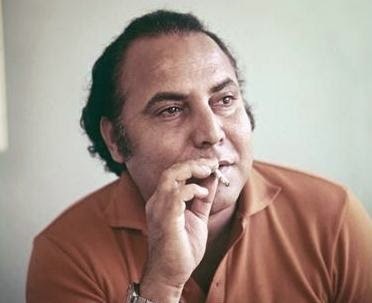 Gave so many melodious films.Starting from 1973 to 2006, for almost 33 years he contributed to hindi film music. He worked mainly for low budge films but gave highly melodious songs. 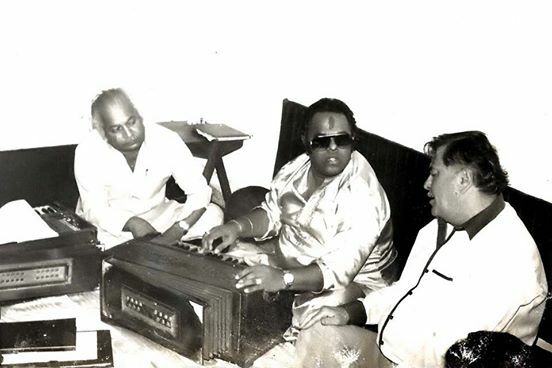 He mainly worked with not so famous singers at that time such as Yesudas, Hemlata, Jaspal Singh, Shailendra Singh etc. Great actor, director and specially known for melodious music, Raj Kapoor tried Ravindra Jain after Shankar Jaikishan and Laxmikant Pyarelal. Pair worked fine and gave best music in Ram Teri Ganga Maili and Henna. Director Sooraj Badjatya also turned to Ravindra Jain after working with Ram-Laxman for three films. Actually Jain had worked for Rajshree production which belongs to Sooraj Badjatya. Sooraj and Jain worked for two films 'Vivah' and 'Ek Vivah Aisa Bhi'. However, 'Ek Vivah..' was not directed by Sooraj. Vivah music was very melodious. He also gave music in television serials such as 'Dada dadi ki kahaniyan', 'Ramayan', 'Alif Laila', 'Shree Krishna'. Image below is self exploratory. Some songs are really great. One such song is Holi Aayee Holi Aayee Dekho Holi Aayee re. We remember and hum this song on every Holi festival. As many know, this song is from Mashaal movie starring Dilip Kumar, Waheeda Rahman, Anil Kapoor, Rati Agnihotri and Amrish Puri. This film worked for Anil Kapoor as it came in his very early period of career and he faced Dilip Kumar with great efforts and succeeded. This was Yash Chopra movie as well. Music was composed by Hridaynath Mangeshkar, brother of Lata Mangeshkar and Asha Bhosle. He has worked very little for Hindi films but given gem songs. Before I take you to another song enjoy this song. lyrics are given below. Found both songs having similar tunes? Are you thinking Hindi song copied? You are half right. Both songs having similar tunes. While Hridaynath made elder sister Lata Mangeshkar singing first song (i.e. Holi Aayee) with Kishore Kumar and Mahendra Kapoor, he made Ashatai singing later song. Later song is from Marathi film Jait Re Jait, which means win-win. Mohan Agashe and Smita Patil acted in it. It was produced by one of the great Mangeshkar sisters-Usha tai. It was directed by Dr. Jabbar Patel. It won President's Silver Medal for Best Feature Film in Marathi at National Film Awards. Jait Re Jait was released in 1977 while Mashaal in 1984. So it is obvious that later film song was totally converted to Hindi song. Both have its own flavour or mood. Hum Bhukhe Nango Ka Raj Zaroor Ayega! When you rewatch a film every time, you find a new thing which you may not have marked earlier. When in club Maya (Nadira) asks Raj to pretend as Rajkumar. 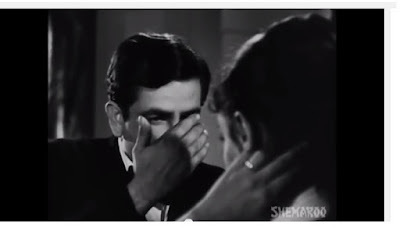 ‪#‎Raj_Kapoor‬ scrolls his hand on face. Upper face shows cute, innocent, honest and joker Raj but after hand is passed his face changes to very smart and cunning Raj. (In background tune of Kisi Ki Muskurahato pe ho nissar plays. The song was taken in Anadi, four years after Shree 420 released . This was another speciality of Raj Kapoor. He used to use tune as background music which was later used in his films). Hats off to Raj Kapoor! Kyunki Saas's Baa is no more! Sudha Shivpuri passed away. She was wife of famous character actor late Om Shivpuri. She was famous for playing long running serial 'Kyunki Saas Bhi Kabhi Bahu Thi' and her character of Baa was also stayed for long in the serial. Serial story went through leap of generation, but Baa's character was kept alive in serial for which there were made lot of jokes. She lived character. She was mother of small time actress Ritu Shivpuri who acted in film like 'Aankhen' (Govinda fame). Sudhajee had acted in films such as Swamy, Burning Train, Insaaf Ka Taraazu, Hamari Bahu Alka, Saawan Ko Aane Do, Vidhaata, Maya Memsaab etc. Heartily sharddhanjali to her. Jaywant Pandya is senior journalist, columnist and tv-web political analyst. He is perhaps only Gujarati journalist who have been working in three languages-Gujarati, Hindi and English. He is one of few journalists who has been working in all form of media-including manuscript, print, television, web, mobile app and radio. He is also perhaps only journalist who have worked in all leading gujarati newspaper and publication including Gujarat Samachar, Divya Bhaskar, Sandesh and Sambhaav group on leading positions. He is also one of few journalist who has worked all around front page news, feature section and supplements. how many people are reading this blog now?